Personal power is about your character and accomplishments. It's the result of who you are and what you do. When you learn how to unlock your personal power, you can achieve your goals and lead a more meaningful life. You'll also find it easier to influence others and take on leadership roles. In some ways, building up your inner power is like building up your outer body. It takes effort and practice. Start with these exercises for cultivating inner strengths and taking positive actions. Understand who you are and what's important to you. Once you figure out your priorities, you can devote your time and resources to the activities that you find most rewarding. You'll also have solid criteria for making moral decisions. Look on the bright side. Preserve your energy and motivation for taking constructive action instead of becoming drained by daily irritations. Question your self-limiting beliefs that damage your self esteem. Have the courage to take worthwhile risks and give yourself credit for trying. Take satisfaction in your past achievements and let them encourage you to take on bigger projects. Recognize your feelings without letting them distract you from making healthy choices. Deal with stress safely by talking sensitive situations over with your friends or taking a long walk. 5. Let go of baggage. Free yourself from grudges and resentments. Forgive yourself and others for any past disappointments. Patiently accept reversals and delays as the price of success. Remember your purpose and renew your commitment when the going gets tough. Stay true to yourself. Be prepared to align your actions with your values even when it's uncomfortable. Evaluate your progress according to your own standards instead of comparing yourself to others. Authenticity gives you real strength. Faith and mindfulness can make you stronger and more resilient. Set aside time each day to give thanks and connect with your spiritual side. Learn how to meditate properly at home and get the full benefit. Practice your faith by seizing opportunities to be kind and generous. Your physical condition affects your personal power. Keep your body in peak condition with a balanced diet rich in whole foods like fresh vegetables and fruits. Exercise regularly and stick to a consistent sleep schedule. Adding to your knowledge and abilities also makes you more powerful. Sign up for educational seminars at work or study a foreign language at your local community college. Take courses online and read classic novels in your free time. You can make yourself more likeable and influential. Ask friends and colleagues you trust for honest feedback about areas where you need to grow. Learn how to communicate effectively to be assertive without aggression. Brush up on your attentive listening or public speaking skills. Monitor your body language and proofread your emails. A robust network gives you more opportunities to leverage your strengths by collaborating with others. Help others by sharing your time, expertise, and other resources. Stay in touch with your old contacts, and attend events where you can widen your circle. It's tempting to limit ourselves to the areas where we feel safe and appreciated. Ensure you're giving adequate attention to both your professional and family life. Time and other resources are limited. Organizing your routines can help you to do more with less. Mental and spiritual strength allows you to take charge of your life and your future. 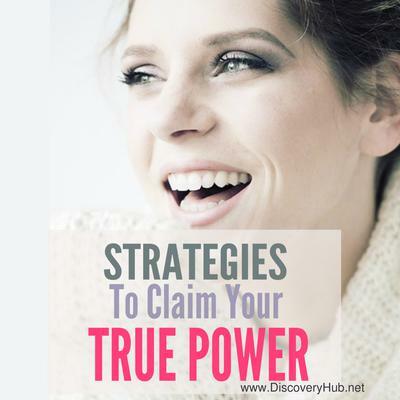 Claim your personal power so you can realize your potential and have a positive impact on the world around you. What is a random act of kindness? It's doing something kind for someone without receiving any type of reward, reciprocation, or recognition. It could be shoveling your neighbor's driveway while he sleeps or buying coffee for the next person in line. Random acts of kindness might seem like something that's great for the person on the receiving end of the kindness, but the person being kind actually gets a lot out of it, too! How can you not feel good about doing something so selfless? You feel like a million bucks when you do something for someone else. Most of the kindness we give or receive comes with strings attached. Giving flowers to your date isn't quite the same as giving flowers anonymously to the old lady that lives on the corner. On some level, we expect something from the kindness we dole out to the world, even if it's just improving our image to those around us. A random act of kindness is different, because your intentions are entirely pure. Try it! You'll love how good you feel about yourself! 2. You realize that there's enough to go around. When you give something away without any hope of receiving anything in return, you're sending yourself a positive message. You're showing yourself that you have sufficient resources and time. There is no lack, no scarcity. In fact, there's an abundance - plenty for you to be grateful for, as well as the recipient of your kindness. 3. You strengthen your health. Research shows that practicing acts of kindness reduces anxiety and increases happiness. Research subjects also report feeling more energetic, positive, and less depressed. Kindness also reduces pain. 4. You make others happy. When you're kind toward someone, you make them feel important and loved. Plus, the people around them are likely to be happier, too. Your simple act could also start a chain reaction of kindness. The person on the receiving end of your kindness might decide to do the same for someone else. And so on. 5. It helps the people that witness the act of kindness. The impact of your kindness reaches further than you think. It has been shown that just witnessing kindness lowers blood pressure and increases levels of hormones that are associated with feeling optimistic. A few random acts of kindness include taking in the garbage cans for your neighbor, leaving a complimentary note on a windshield, giving a small gift card, or cleaning the snow and ice from someone's car. The possibilities are nearly endless. What ideas do you have? You can have a huge impact on the world just be being kind. You'll help yourself, the recipient of your kindness, all those who witness it, and the multitude of people down the chain. A simple act of kindness doesn't have to cost you a dime, but the returns are priceless. There are countless opportunities to be kind each day. Think of someone you could help in a simple, but meaningful, way. Try to be kind without any expectation of receiving anything in return. Notice how you feel afterwards. You won't want to stop.